Nicole's Needlework: Happy New Year!! I'm home from Florida! I just got home tonight and I'm so happy to be here! I had a great time with my family, but I'm ready to get back to my routine. I have missed my bed and my stitchy spot! 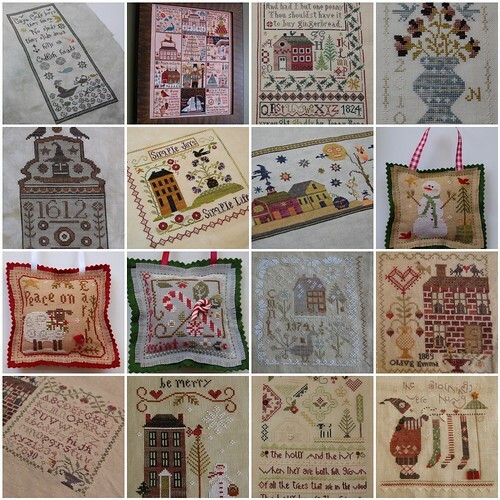 :) Speaking of stitching, I thought I'd share my 2010 finishes. Not a whole lot stitched on it since the last pic. I'm seriously thinking of starting another big sampler for New Year's (I know, I've lost it)! Elizabeth J M Mears 1833. I fell in love with this design after seeing Ellen's wip pic. Well, I hope you all have a very Happy New Year's. I plan to get settled on my couch and ring in the new year with my stitching (maybe even with Elizabeth)! :) Write soon!! Happy New Year to you and your family, Nicole. 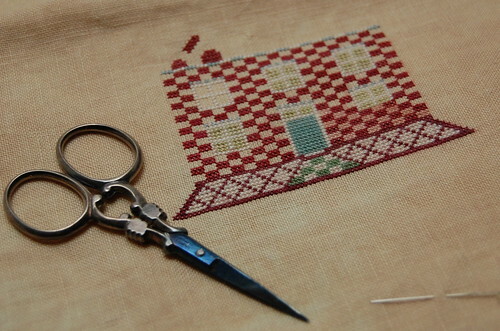 I hope 2011 brings you lots of stitchy time. I know what you mean about sleeping in your own bed - my parents have been visiting for 3 weeks now, and they have been sleeping in my bed, while DH & I share an air mattress - it's been wonderful having them visit, but I'm looking forward to having my own bed back! Great 2010 finishes! I love them! I'm probably going to be starting Frances Eden tomorrow even though I said I wouldn't. :D Elizabeth is a temptation, I have to say. Happy New Year! I hear you on your own bed. Enjoy! Glad you made it home safely! All of your projects look great...hope you have a very productive year in 2011! Welcome back! I know you were homesick. Love the collage and all your finishes--and I can't believe that you are a little disappointed there aren't more! 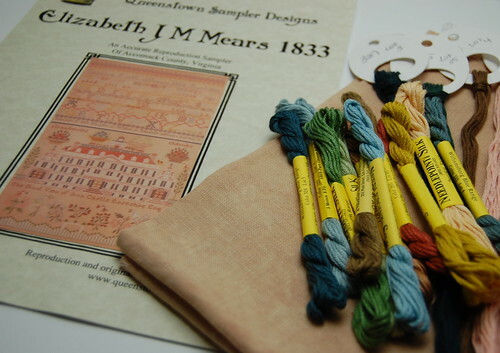 I haven't finished kitting up Liz Mears, but I'm thinking of it, thanks to you and the link you provided. No you haven't lost it Nicole - the more projects the better, right? Love all your finishes. Every time I see one of them, I want to add it to the list. You always pick the nicest ones and your pictures always do them justice! Love your collage! I hope that you have a wonderful 2011!! All your finishes are gorgeous! Happy New Year! Welcome Home. The number may have been less than you wished, but they are really nice! And you're off to a blazing beginning for the new year. Happy New Year to you and your loved ones! Beautiful finishes last year, Nicole! Happy New Year! Beautiful finishes in 2010. Look forward to seeing your stitching in 2011. Happy New Year. Happy New Year Nicole. Loved seeing all you've accomplished in 2010. Happy New Year! Best to you and your family for 2011. You have some beautiful finishes for 2010. You will love Elizabeth Mears. Barbara Hudson of Queenstown is a member of our guild. She was working on the model during our retreat last August and was about the half way mark we couldn't believe how fast she finished it. It is an absolutely beautiful sampler. Happy New Year, glad you are home safe and sound. Love your collage and Frances Eden start, can't wait to see your start on Elizabeth :-). Some beautiful finishes , well done . Happy New Year. Great finishes for 2010! Glad you got back home safely. I can't wait to see what all you stitch this year. You got so much done last year! Happy New Year. Beautiful finishes, Nicole! I find it always a relief after vacation to have that first sleep in my own bed! Looking forward to seeing all your lovely work in 2011! Happy New Year! GORGEOUS finishes you had in 2010! Have fun with whatever you decide to start. Stitching is all about FUN! Happy New Year, Nicole! I love your 2010 finishes. All are gorgeous! I am planning to start Frances Eden soon myself. 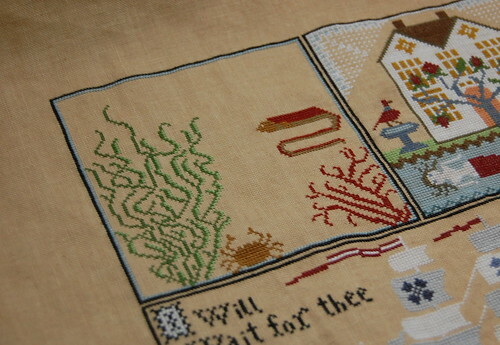 It is such a beautiful sampler. So is Elizabeth J M Mears. Looking forward to seeing your progress on it as well. Nicole, I think you have accomplished a lot in 2010 !!! Your work is just beautiful... Happy New Year to you!! Your finishes are wonderful. All beautiful and I love the way you displayed them on this post, it made it very easy to see all the pretty stitching. I think you have done some wonderful stitching this last year, Nicole!! We are always never satisfied with what we accomplish, are we? Nothing like home to make one feel 'whole' and relaxed, enjoy being in yours! Happiest of New Year's Wishes coming your way for you and your family!